Wanna take on the Kessel Run? The Millennium Falcon speeds away from a TIE Fighter. Retro art poster from artist Mike Kungl. Limited edition of only 125 hand-numbered pieces! Hire the Millennium Falcon! 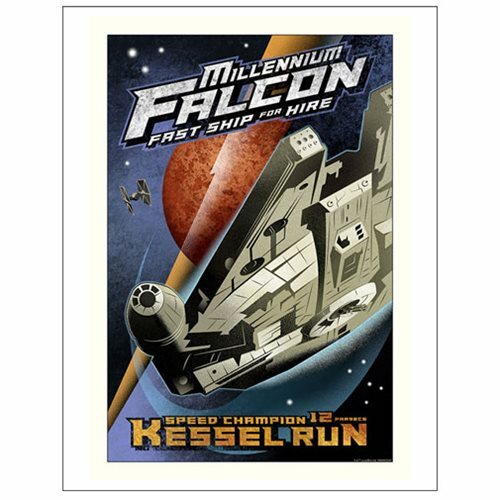 From artist Mike Kungl, this 22-inch tall x 17-inch wide Star Wars Kessel Run by Mike Kungl Paper Giclee Art Print is a limited edition of only 125 hand-numbered pieces. The unframed retro ad poster features Han Solo's pride speeding away from a TIE Fighter and reads "Millennium Falcon: Fast Ship for Hire. Speed Champion. 12 Parsecs Kessel Run." Certificate of authenticity included. Ages 13 and up.